Spot the difference | Mike Hitchen Online: Mike Hitchen Unleashed - telling it like it is! 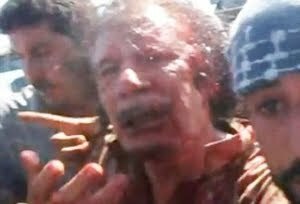 Can you spot the difference between Libya's "heroic" "freedom" fighters and mad tyrant Gaddafi? There isn't any. Not judging by the lynch mob mentality we witnessed yesterday. The lavish, fawning praises heaped upon so called freedom fighters, by the morally bankrupt and gutless Obama and Cameron, (two leaders who have lost control of their own countries as they stand helplessly by and watch their once mighty nations fall into social and economic decay) does not turn yesterday's savagery into a moment of glory. Taking the law into their own hands, these glorified football hooligans denied true justice and closure to untold numbers of victims of Gaddafi's cruelty and tyranny. "Freedom" fighters, don't tell me not to spoil your "glorious day" for there was no glory. The historic moment was marred not by me - or by any other political commentator who feels the same way, it was bloodily tarnished by the heroes who so quickly and readily, turned into self appointed judge, jury and executioners. Not one world leader has had the courage to condemn the actions of the frenzied mob who over the months have proved themselves to be no better than the man so many of us wanted removed. We have come a long way from the days when a NFZ was required to protect peaceful protestors demanding reform. Unarmed protestors morphed into rebels, then Western armed and guided opposition forces, then into the NATO installed Pretendy Government's armed forces - with increasingly nicer uniforms and increasing abuses of human rights and disregard for the rule of law. Go ahead Obama and Cameron, continue lavishing praise on those you would condemn in your own country. But we shall remember your glowing speeches while we watch with sadness, the inevitable and predictable descent into chaos and unrest, that for your own self-serving, nationalistic and political agendas, you actively and directly encouraged and fostered. Just as with the failures of Iraq and Afghanistan, Libya will fall victim to the actions of the West - the so called, self styled "good guys"